For the last several months, I’ve had the Blog Block Blues. Does that sound like a 1:00 am piano blues instrumental? Well, that’s what I call my own soulful, blogging sloth. I’ve been busy, yes, but just not with blogging. My ideas are there but I’ve lacked the cerebral will to work through them to publication. My last post was in July and here it is late September. Even though my earlier blog page views are steadily increasing, they’re based on former posts not new content. But now, I’m back at it and surprisingly, my energy has been jump started by an environmental art installation that I saw in Breckenridge, Colorado several weeks ago. The 2015 Breckenridge International Festival of the Arts (BIFA) showcased Australian artist Konstantin Dimopoulos’ The Blue Trees project. For the installation, volunteers throughout the downtown temporarily transformed tree trunks -- mostly aspens and cottonwoods -- by applying a water-based, biologically safe ultramarine blue pigment. It reminded me of an avenue of International Yves Klein Blue columns at an elevation of 9,600 feet. Beyond being surprisingly beautiful, the trees are visually provocative and make you think about how color can change your perception of the natural world. According to a FACTS + FAQS posted about the project, "Color is a powerful stimulant, a means of altering perception and defining space and time. Blue is a color that is not naturally identified with trees and suggests that something unusual, something out of the ordinary is happening. In nature, color is used both as a means of protection and as a mechanism to attract. The Blue Trees is an attempt to elicit a similar response from viewers and inspire conversation and action around deforestation issues." 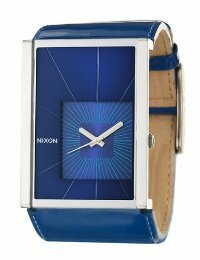 So how does Dimopoulos’ Breckenridge Blue Trees connect with my interest in wristwatches and extend the deforestation conversation? The segue way is trunk color to dial color. Quirky as this may seem, it has reminded me of how art and time can have a reality-based, conceptual intimacy. The blue dial bandwagon has been growing worldwide over the last few years writes Mark Bernado in his post, "Feeling Blue: 21 Watches with Blue Dials and Blue Straps." Not surprisingly, the luxury likes of Rolex, Omega, Bremont, Breitling, Harry Winston, Jaquet, Droz, Patek, Philippe, and Louis Moinet to name a few have all introduced blue dial models over the last several years. So I decided to explore the blue dial trend and went looking for women's models that in their designs recalled my aesthetic excitement at seeing Dimopoulos' trees. After looking at literally a forest of blue-faced possibilities, I found one to herald my flagship return to writing. 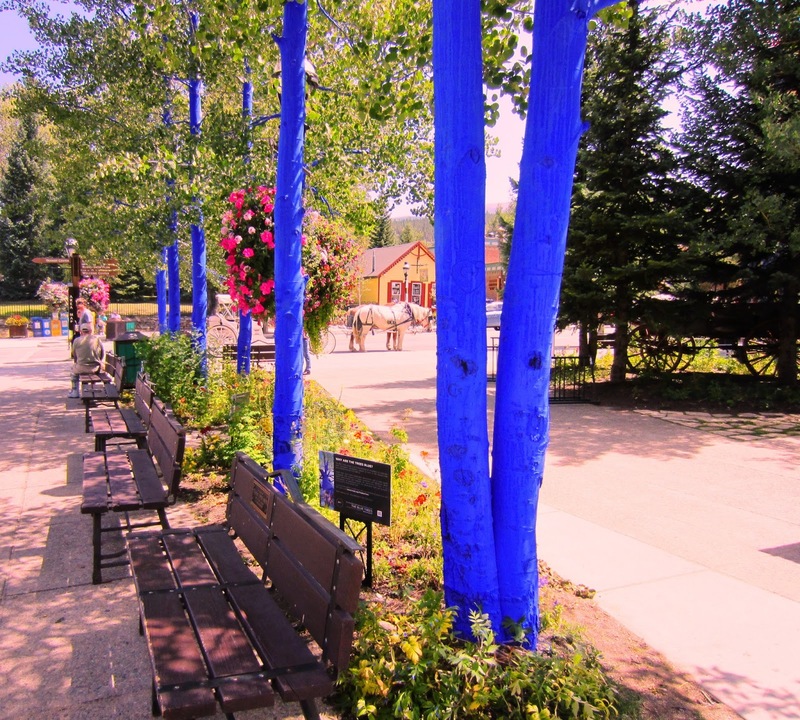 It reflects Dimopoulos' worldwide Blue Trees installations in such cities as London, Vancouver, Houston, and Albuquerque and represents his environmental message. This is the perfect watch to lead my own Blue Dial Bandwagon. It embodies the universal precept that one way to combat climate change resulting from deforestation is to recycle materials and buy products made from them. 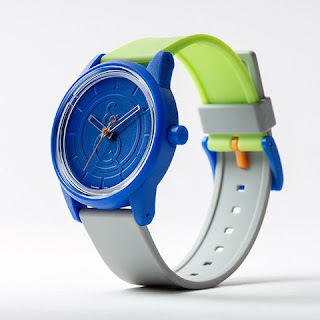 This watch is ultra affordable (around US $40) and has a case and strap made from recycled materials. Another plus. It does not require batteries. It's powered by the sun -- just as sunlight nurtures the growth of trees -- with one solar charge keeping the watch going for up to 3 1/2 months. The solar cell resides at the edge of the dial from the 2 to 10 o'clock position like a smiley face. This year, The Q&Q SmileSolar Series received an award in the Good Design Australia Selection in the "Housewares, Fashion, and Objects" Category. The judges "highly appreciated the sophisticated design underpinned by solid environmental credentials." As fall's autumnal-hued leaves and dials claim our attention, take time to also see the natural landscape as blue-hued. I hope that with this post, you like me are inspired to see blue as the new, tree trunk white, tan, brown or gray and what conservation and recycling mean to preserving our planet's life. Update (October 3, 2015): I've just read about a new book that reflects some of the ideas writers and artists have had about expressively connecting with nature. It's titled, The Oxford Handbook of Ecocriticism (Greg Garrard, editor, Oxford University Press, 2014). In a comprehensive review of it by Sam Solnick in The Times Literary Supplement September 4, 2015, he writes, "Ecocriticism is the body of thought and work that broadly put, studies the relationship between ecology and the arts, particularly in the face of an emerging sense of environmental crisis."